Aboriginal and Torres Strait Islander readers should be aware that this review contains images or names of people who have since passed away. During 2015 and 2016 the exhibition No Boundaries: Aboriginal Australian Contemporary Abstract Painting travelled to different venues in the United States. Drawn from the collection of an American couple, Debra and Dennis Scholl, the featured works were by nine senior Australian Aboriginal men. The exhibition presented the paintings of these male artists, and Indigenous Australian art more broadly, as vital examples of contemporary art conceived of on the most global scale. Now another travelling exhibition, Marking the Infinite: Contemporary Women Artists from Aboriginal Australia, which is currently on view at the Phillips Collection in Washington, DC, does the same for nine female artists. Like No Boundaries, the Marking the Infinite exhibition consists of works from the Scholls’ collection. This time around, however, roughly half of these were commissioned directly from the artists, and many of the pieces are on a larger scale than the artists had previously executed. The results are striking. Both exhibitions were organised by William L. Fox, director of the Center for Art + Environment at the Nevada Museum of Art, and Henry F. Skerritt, an Australian art historian who is the curator of the Indigenous Arts of Australia at the Kluge-Ruhe Aboriginal Art Collection of the University of Virginia. The title of the current show references a theme that unites the included artworks: that human mark-making can at one and the same time conjure an intense palpability of place and address the universal. As Skerritt observes in the opening essay of the informative accompanying catalogue, ‘over the past three decades, women artists from Aboriginal Australia have provided some of the most compelling and prescient examples of this type of world-picturing’. The Phillips version of Marking the Infinite was arranged by Klaus Ottmann, the museum’s Deputy Director for Curatorial and Academic Affairs, and the installation frames this thematic connection well. Wall panels contextualise the works in relation to ancient Aboriginal Australian traditions and to global contemporary society (though more explanations of such complex cultural concepts as the Dreaming and songlines would have been helpful). Ottmann’s decision to present the works on walls of various colours, in largely warm, earthy hues, was particularly inspired, for it lends the show a grounded quietness, recalling the colours of the remote Australian landscapes where the women live and work. Against this unifying physical and thematic background, each artist’s distinct formal inventiveness lends the exhibition an exhilarating aesthetic liveliness. For instance, three prominent bark painters from Arnhem Land’s Yolngu people are included: Nonggirrnga Marawili (c.1939), Nyapanyapa Yunupingu (c.1945), and Gulumbu Yunupingu (c.1943–2012). While each draws upon the ancestral symbols specific to their clan, all three artists also emphasise their own personal interpretation of the iconography, distancing it from its sacred origins and realising a singular aesthetic. By way of each artist’s careful repetition of marks, they create patterns that powerfully evoke the natural landscape; for Gulumbu Yunupingu, the Yolngu creation stories regarding the stars take on a more universal meaning in her multifariously patterned renditions of Ganyu (Stars) (ranging from 2002 to 2010). 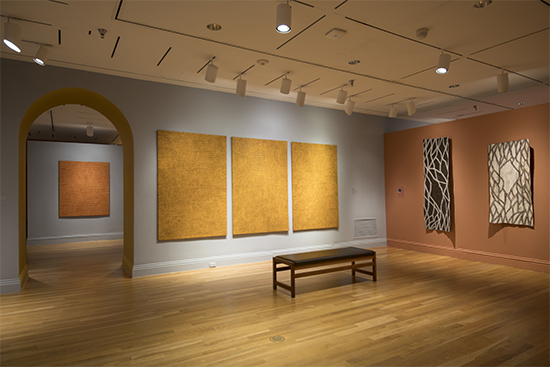 A similar concern is displayed in the four large Bush Plum canvases (ranging from 2006 to 2015) of Utopia artist Angelina Pwerle (c.1946), where thousands of painted dots reference the bush plum plant, its Dreaming tale, and, by their precise application on vast canvases, the celestial sphere. The paintings of Yukultji Napangati (c.1971), on the other hand, are more evocative of the desert landscape. Three compositions depicting Women’s Ceremonies at Marrapinti (all 2015) are displayed together at the Phillips, and this multiplication intensifies the startling visual impact of the individual works. Set on dark backgrounds, the countless repetition of yellow and orange dots, which merge to form short trails that continually shift in orientation, creates a sense of movement that evokes shifting sand and the journeys of the artist’s ancestors. That the canvases display the visual effect of shimmer, as though an invisible force field on the plane of the painting flickers momentarily into view, only enhances the thrill of the viewing experience. 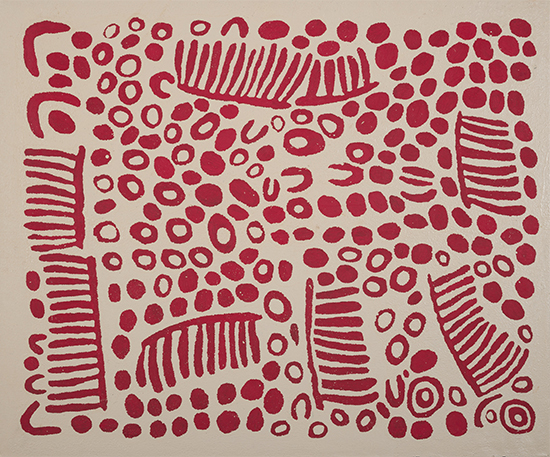 Carlene West (c.1944) also uses trails of dots to denote ancestral pathways in her Country of Tjitjiti, the vast salt lake in Western Australia, but in a series of large-scale paintings from 2015, each of which is called Tjitjiti, she combines these precise markings with expansive sweeps and eddies of paint. Applied on a smooth black background, these brushstrokes, which combine washes of synthetic polymer with sections of impasto, create magnificently expressive depictions of the salt lake. 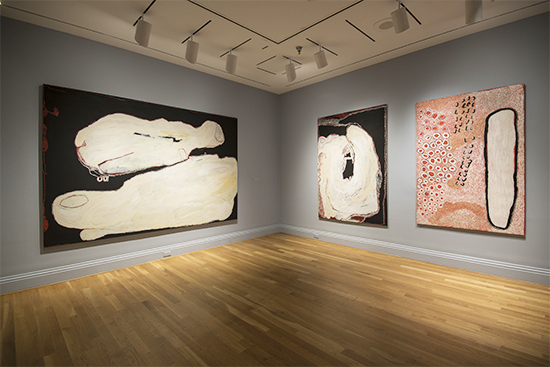 That this land form, which initially reads as white, is in fact created from hues of white, cream, rose, pale yellow, and beige, emphasises its physical nature, as though through the application of paint West creates not merely a simulacrum of Tjitjiti, but a living embodiment of her land and Dreaming. Hanging alongside West’s canvases are paintings by Wintjiya Napaltjarri (c.1930–2014), where the process of mark making similarly enacts cultural meaning. 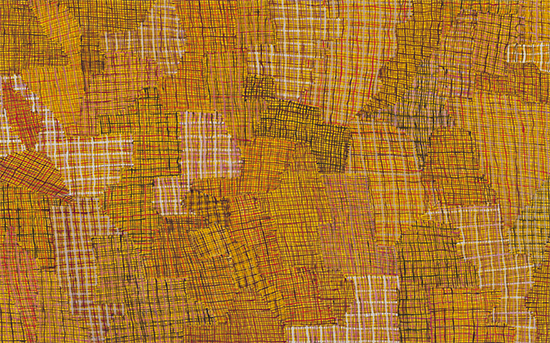 In the five included renditions of Women’s Ceremonies at Watanuma (ranging from 2006 to 2011), Napaltjarri uses abstract symbols to tell the stories of her ancestors. Rather than depicting the symbols on top of the canvas background, however, she builds up fields of thick white acrylic paint that eventually surround and construct the required shapes. It is the intensely engaged, physical act of applying the porcelain-like finish – a process akin to the ceremony of body painting – that enables the sacred tales to emerge. The theme of interconnectedness between a humble mark and the vastness of the universe is particularly apparent in the exhibition’s main gallery. In what is a splendid installation, paintings by Gulumbu Yunupingu and Yukultji Napangati, and decorated wooden Larrakitj poles by Gulumbu Yunupingu and Nonggirrnga Marawili, are displayed alongside works by Lena Yarinkura (1961) and Regina Pilawuk Wilson (1948). Both of these latter artists engage with connective yarns in a quite literal sense. Yarinkura, who lives and works in Arnhem Land, was taught how to weave by her mother, Lena Djamarrayku, and has since gone on to pioneer new forms in Aboriginal fibre art. Included here are two examples of Yawkyawk (female water spirits) and two of Spider (all 2015). These supremely characterful, large-scale sculptural works combine woven nets and webs with totemic creatures in such a way that – as the artist is clear to emphasise – the traditional symbols of her Dreaming are re-presented anew. Similarly innovative are Wilson’s large-scale painted abstractions of fishing nets. Syaw (Fishnet) from 2015, for instance, is a vast, vibrant canvas that resembles a colourful patchwork quilt or bright plaid blanket. Its intricate combination of colour and line in fact resurrects the weave of traditional Aboriginal fishing nets, a technique that was lost following white settlement. Wilson, who also travelled to the Phillips Collection to paint a wall mural in its courtyard, was originally a fibre artist, and through the transferral of the syaw from woven bush vines to acrylic paint on canvas she imparts new, vigorous life to ancient heritage. In recent years, women have been at the forefront of contemporary Aboriginal Australian art. The innovative pictorial and conceptual tapestries included in Marking the Infinite demonstrate why. Through a weave of intimate marks, the nine artists map their knowledge of sacred Country, but such is the generous expansiveness of their works that they are not curtailed by these bounds. It is energising to think that women from one of the world’s oldest cultures, working in remote parts of Australia, are making some of the most globally relevant art today. Marking the Infinite: Contemporary Women Artists from Aboriginal Australia continues at the Phillips Collection in Washington, DC until 9 September 2018. It will be on view at the Museum of Anthropology, the University of British Columbia, Vancouver, from 1 November 2018 until 31 March 2019.